I first met speculative fiction writer Brandon Barr years ago. As I recall, he joined the Christian Science Fiction and Fantasy Blog Tour. We exchanged many emails as a result and somewhere in mix I learned that Brandon lived in Southern California as I do. In short order I invited him to join the small group of speculative fiction writers that met approximately once a month, and he eagerly accepted. We hit it off at once, shared common goals, felt our group could help us develop our writing. But Brandon was unable to join us at the next meeting or the next. After a short time he was diagnosed with leukemia. 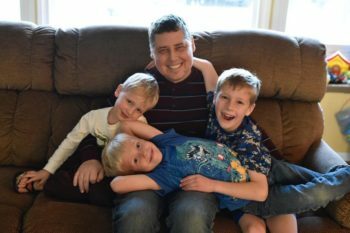 He went through a battle with the disease, including two bone marrow transplants. When the cancer came back this year, the doctors were not hopeful. They projected that he’d live one to two months. Brandon himself said he thought it felt like it would be one month. 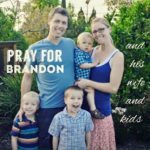 Our dear friend, Brandon, is now is the arms of Jesus. He peacefully entered into heaven this afternoon. As he took his final breaths, he was surrounded by friends and family worshiping God. He’d sing “Bless the Lord, Oh my Soul” to his boys every night before bed and we were singing that as he drifted off. He passed at 1:30pm on Wednesday, November 21. Please pray for Amanda and the boys during this time. Please pray for the family and those effected by this loss. Thank you for your love and support. Thank you for your prayers. I began to write stories when I was twelve, the same year I read my first thrilling Crichton book, Jurassic Park. Fast forward ten years–it was my senior year of college, and I was given a creative writing assignment. That project utterly rekindled my love for writing. At first, I never imagined writing novels. Short stories were my thing, a la one of my biggest inspirations, Ray Bradbury, who was a prolific short story writer. I was also reading a lot of old Hugo and Nebula award-winning short story anthologies. Those served to fuel my love for the speculative genres of science fiction and fantasy. With more than a dozen short stories under my belt, I ventured into novel writing with a co-author named Mike Lynch. Mike and I spent about a decade honing our craft and wrote some decent boks, and some pretty darn good books, and we were able to publish them traditionally. I also published several short stories in magazines and Ezines that have mostly disappeared out of print. 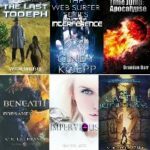 After a lot of growth as a writer, I finally felt like I’d found my voice. And I discovered that I wanted to write fiction that was both intense and action-packed, but fiction that also could transcend boundaries and reach to the core of our common humanness. Our questions, our pains, and our hungers. I am thrilled to focus my attention on writing exciting science fiction and fantasy, as well as interacting with readers (I love it!). I respond to every email I receive and am humbled to be where I am at in life, having battled (AML) Leukemia in 2015 to 2016. When not writing, I love to garden, hike, fish, play softball and baseball, backpack the Sierra Mountains and play board games. I do most of these activities with my wife and three boys. My family and I attend a small church in Southern California which just so happens to be absolutely infested with wonderfully artistic members who cheer each other on. So here I am, doing what I love now, writing the kind of stories I love, Science fiction and fantasy with soul. 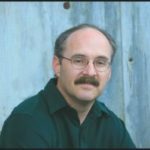 His pulp fantasy series, Path of Heroes, co-written with Michael Anderle, is a sword and sorcery blend with a post-apocalyptic vibe (and a good dose of bawdy humor). Rogue Mage, book one in the Path of Heroes series was an Amazon #1 bestseller in three categories. 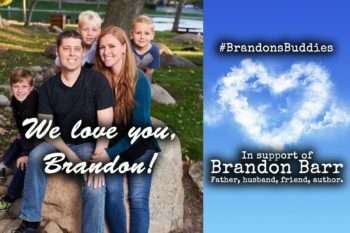 Brandon leaves behind his wife Amanda and three young sons. 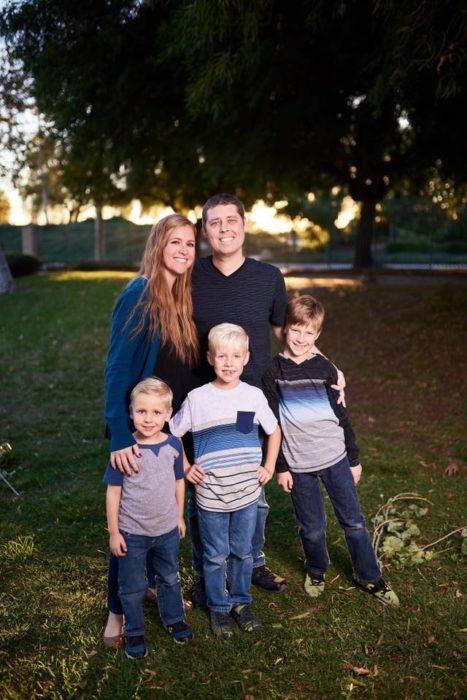 If you’d like to help the Barr family there’s a GoFundMe account set up for them. Man, this grieves me. I never knew him at all, but how terribly difficult for his family. . .